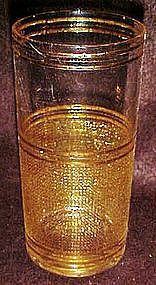 Nice heavy drinking glasses are clear with lots of gold accent. The bottom section has a fabric relief texture. It makes it nice for gripping the glass. Each measures 5 1/2" tall and there are a complete set of 8. All are in excellent condition and would go well with most china.